There are two kinds of people in the world, okay. People who keep a list of the books they read, and monsters. My own reading is a mish-mash of fiction and non-fiction across all kinds of topics. I love to read about new subjects, and of course I have old favourite topics that I can slip back into, the ones that feel as comfortable as old shoes. My reading goes through phases, too. I remember a spell of reading fiction set in fishing communities. Currently, I’m in a spell of reading about the idea of less – whether that’s decluttering the physical environment or reviewing time commitments. The Salt Path by Raynor Winn. This is a really enjoyable memoir. Losing your house and all you have financially in a legal battle sounds pretty terrifying (I’m into the idea of less, but not that much less! ), but imagine that news sinking in and, as the clock ticks before you’re evicted and become homeless, your husband receives a terminal diagnosis. That’s what happened to Raynor Winn, and this is her story of what happened next – a 630 walk with her husband along the South West Coast Path. Imperfect Courage by Jessica Honegger. While the theme of this book is the idea of going scared, my bigger takeaway from it was a real appreciation of the work that Jessica personally, and her company Noonday Collection, does in supporting our developing countries. I admit I bought this book because Brene Brown wrote a testimonial for it, and reading it made me set up a Kiva account and commit to giving regularly. The Power of Less by Leo Babauta. Like I say, I’m in a phase of my life where I’m thinking about clutter and moving towards less. My daughter can barely leave a toy out without me sticking it on eBay. My biggest takeaway from this book was the reminder that physical clutter is often because things don’t have a home. That set me on a mission of decluttering, a drawer at a time, and buying storage containers and things so that it became clear what should live where. Postcards from a Stranger by Imogen Clark. I belong to an informal writing group with Imogen, and was delighted to celebrate her success with this beautiful novel, which reached number one in the whole of the Amazon charts very recently. It’s easy to see why. The writing is clever, the characters are entirely believable, and right when you think you’ve worked it all out, there’s another twist. 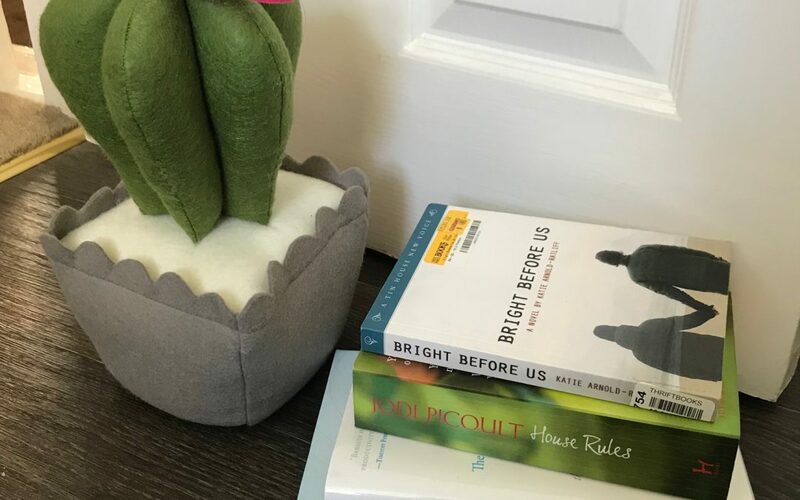 Bright Before Us by Katie Arnold-Ratliff. I’m sounding like a total fan girl here, but I bought this book because *someone* I really admire recommended it. I want to say it was Brene Brown again. What can I say? If Brene mentions it, I’m buying it! This is a really atmospheric novel about a young teacher who, with his students, discovers a dead body. It’s absolutely worth a read. House Rules by Jodi Picoult. I’m a big Picoult fan and this novel, about a woman whose son with Asperger’s Syndrome ends up being accused of murder, is really excellent. As mom of a child with additional needs, it hit pretty close to home in places, so it wasn’t a comfortable read, but sometimes the uncomfortable reads are the necessary ones. *The picture doesn’t show all of these titles because some were read on my Kindle, but others I passed on to friends. I love to share books. I’ll try to hang on to the full list for future months’ photographs but, you know, I’m all about less right now! That’s it for September. I already have a pile of books to get through in October and I’m going to *try* not to buy any others until I’ve read those. I constantly have a basket full of items ‘to buy later’ on Amazon.